They want to know if radiation from … computed tomography (CT) scans … will increase their risk of developing cancer… In 2006, about 62 million CT scans were performed in the United States, compared with just three million in 1980…Most of what we know about the risks of ionizing radiation comes from long-term studies of people who survived the 1945 atomic bomb blasts at Hiroshima and Nagasaki. 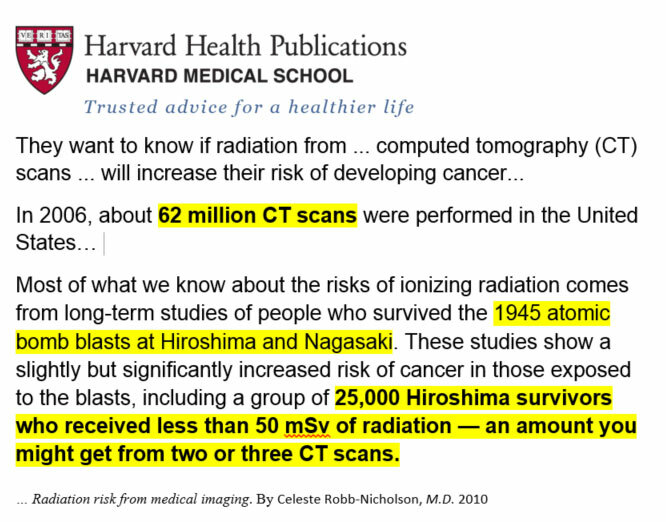 These studies show a slightly but significantly increased risk of cancer in those exposed to the blasts, including a group of 25,000 Hiroshima survivors who received less than 50 mSv of radiation — an amount you might get from two or three CT scans. 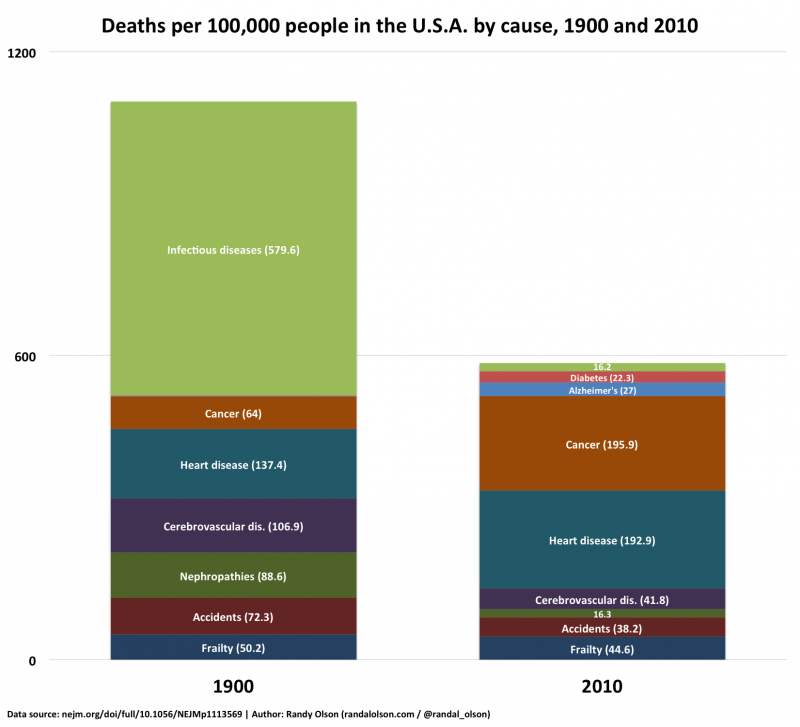 The proportion of total radiation exposure that comes from medical sources has grown from 15% in the early 1980s to 50% today. 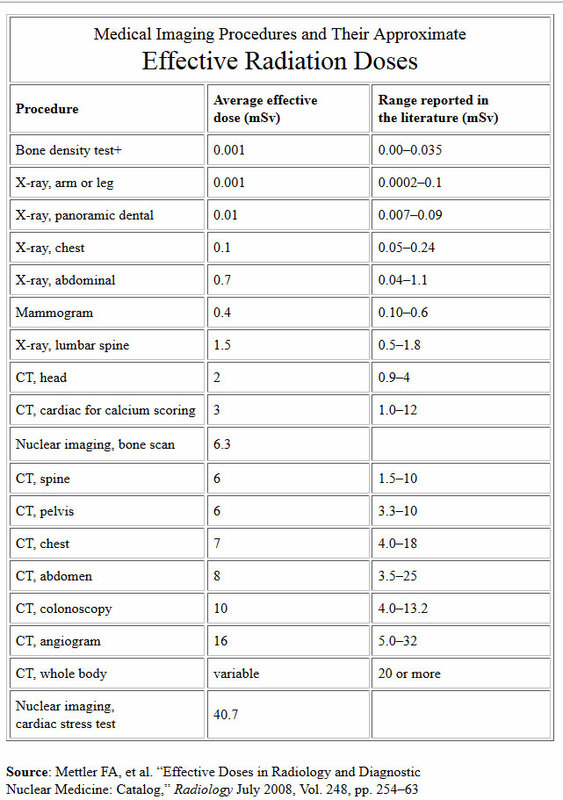 CT alone accounts for 24% of all radiation exposure in the United States, according to a report issued in March 2009 by the National Council on Radiation Protection and Measurements… A chest x-ray, for example, delivers 0.1 mSv, while a chest CT delivers 7 mSv (see the table) — 70 times as much. And that’s not counting the very common follow-up CT scans. –Celeste Robb-Nicholson, M.D.